January 7th: SinÃ©ad Bean de Valera died in Dublin aged 96. January 27th: Death of Mother Mary Martin, founder, of the Medical Missionaries of Mary, in Drogheda. January 30th: Charles Haughey was brought back onto the Fianna FÃ¡il front bench. February 10th: IRA ceasefire began. 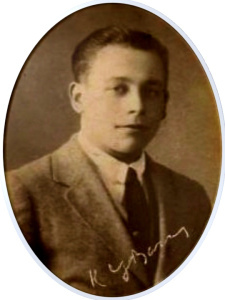 February 20th: Hugh Ferguson, 19, chairman of the Whiterock IRSP, was shot by the OIRA. A number of attacks by the OIRA on the IRSP followed. 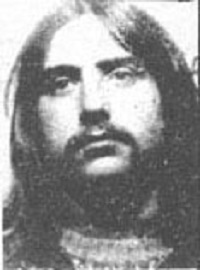 February 26th: The IRA shot dead policeman Stephen Tibble in London. The following day the police announced the discovery of a PIRA bomb factory. March 13th: Two people died in a loyalist attack on Conway's Bar in Greencastle, Belfast. L'Escargot March 14th: Canadian PM Pierre Trudeau visited Ireland, and talks were held at Dublin castle. March 17th: IRA prisoner Thomas Smith was shot dead trying to escape from jail in Co. Laois. 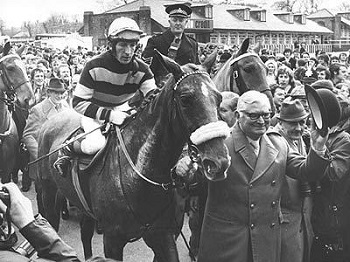 April 5th: Irish racehorse L'escargot won the Grand National, ending Red Rum's winning streak. April 12th: Loyalists killed six people at the Strand Bar in Belfast. April 17th: Mary Immaculate College, Limerick, and Our Lady of Mercy College, Carysfort became recognised colleges of the National University of Ireland. May 1st: Constitutional Convection Election held in Northern Ireland. May 14th: Patrick Galvin's We Do It For Love, a satire on The Troubles, opened at the Lyric Theatre, Belfast. May 31st: IRA killed volunteer Eamonn Molloy, accused of informing. He became one of the Disapppeared. June 3rd: Two Protestant civilians and on off-duty UDR man were shot dead by republican paramilitaries in Killeen, Co. Armagh. June 18th: Danny O'Hare became acting director of the National Institute for Higher Education, Dublin. June 22nd: Three Catholic and two Protestant civilians died as a result of separate acts of sectarian violence. July 14th: Merlyn Rees, then Secretary of Sate for Northern Ireland, announced that British army patrols and house searches would be scaled down in response to the IRA ceasefire. July 29th: Death of Royal Showband member Tom Dunphy in a car accident. July 31st: The Miami Showband massacre. Three members of the band died alongside two UVF paramilitaries. August 10th: Death of Robert Barton, longest living signatory of the Anglo-Irish Treaty. August 15th: Birmingham Six found guilty. August 28th: Willie John McBride retired from international rugby. October 2nd: Death of sculptor Seamus Murphy. October 2nd: Twelve people killed in UVF attacks. October 3rd: Tiede Herrema, a Dutch industrialist who owned a factory in Limerick, was kidnapped. October 12th: Seventeeth-century Archbishop Oliver Plunkett was canonized by Pope Paul VI. November 6th: Businessman Tiede Herrema rescued in Co. Kildare after a siege. The Guildford Four November 18th: Two civilians died when the IRA threw a bomb into Walton's restaurant, London. November 27th: Guinness World record founder Ross McWhirter shot dead by the IRA. December 5th: Internment ended, with the final 46 people detained without trial released. December 12th: IRA siege on Balcombe Street in London ended peacefully. December 30th: The Minister for Agriculture announced that all future funds for veterinary medicine would be allocated to University College. Sixteen men were executed following the Easter Rising; this book charts the lives of seven Easter widows, concentrating on their relationships before the Rising and describing their paths in the years that followed. First is Kathleen Clarke, wife of Thomas, the most senior amongst the leadership and the man who Kathleen thought should have been named President. 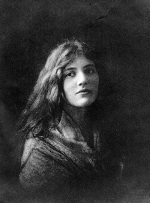 After the Rising, Kathleen remained politically active and opposed the Treaty; despite setbacks she held many leading roles including Mayor of Dublin. The longest lived of all the widows, she responded to Bloody Sunday 1972 with 'sadness but not surprise'. 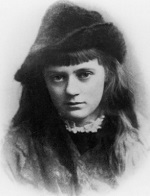 Maud Gonne was another major figure who had worked for Irish freedom for years before her unhappy marriage to John MacBride. By the time of the Rising they were long estranged and Maud was living abroad. She took became a critic of the Free State and campaigned for prisoners' rights, earning the sobriquet 'Maud Gone Mad'. Lillie, wife of James, seems to have been a more retiring figure, concentrating on her large family, some of whom followed their father into political activism. 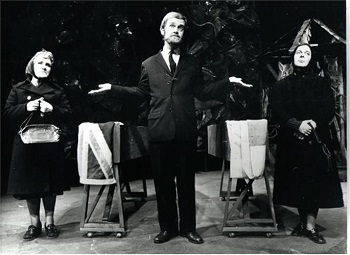 Frances O'Brennan shared Edward Kent's enthusiasm for Gaelic culture enough for both to change their names, with Frances becoming Ã�ine and Edward Ã‰amonn. Agnes Hickey waited years for Michael Mallin to finish his military service in India, an experience that converted him to Irish nationalism. Mallin's final letter from jail, when he laments his 'little man', his youngest son, is heart-rending. He asked for two of his children to enter religious orders, which they did. Sadly, Agnes was one of those subsequently neglected by the new state. Sisters Grace and Muriel Gifford both married leaders of the Rising. Grace is famous for her wedding to Joseph Plunkett in Kilmainham Gaol, hours before his execution. Muriel's story is perhaps the most touching. Having already suffered depression and physical illness, she drowned in the sea a year after the Easter Rising while on holiday with other political families. Rev. John O'Rourke, P.P., M.R.I.A. Published in 1902 by James Duffy and Co., Ltd. The deaths at Bantry had become fearfully numerous before it attracted any great share of public sympathy, or even, it would seem, of Government attention. The Southern Reporter of January the 5th publishes this curt announcement from that town: "Five inquests to-day. Verdict - Death by starvation." The jury having given in its verdict, the foreman, on their part, proceeded to say that they felt it to be their duty to state, under the correction of the court, that it was their opinion that if the Government of the country should persevere in its determination of refusing to use the means available to it, for the purpose of lowering the price of food, so as to place it within the reach of the labouring poor, the result would be a sacrifice of human life from starvation to a fearful extent, and endangerment of property and the public peace. This remonstrance was committed to writing, and signed E. O'Sullivan, foreman; Samuel Hutchins, J.P.; Richard White, J.P.
One of the five cases was that of Catherine Sheehan, a child two years old. She had been a strong healthy child, never having complained of any sickness till she began to pine away for want of food. Her father was employed on the public works, and earned ninepence a day, which was barely enough to purchase food for himself, to enable him to continue at work. This child had had no food for four days before her death, except a small morsel of bread and seaweed. She died on the evening of Christmas day. 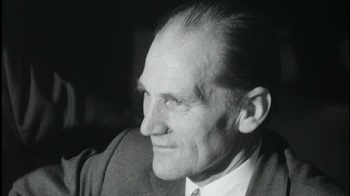 The case of Richard Finn was another of the five. He went into a house where they were making oatmeal gruel. He begged so hard for a little, that the woman of the house took up some of it for him, when it was about half boiled. The food disagreed with him, and he was able to take only a small portion of it. He soon got into a fainting state, and was lifted into a car by four men, in order to be carried to the Workhouse. One of the priests, Rev. Mr. Barry, P.P., was sent for. He was at the Relief Committee, but left immediately to attend Finn. In his examination before the coroner, he said he found him in a dying state, but quite in his senses. He would not delay hearing his confession till he reached the Workhouse, but heard it in the car. Finn was then removed to the House, and laid on a bed in his clothes, where he received the sacrament of Extreme Unction. "I feared," said the Rev. Mr. Barry, "the delay of stripping him." And the rev. gentleman was right, for he had scarcely concluded his ministrations when Finn expired. Every Catholic will understand how severely the physical and mental energies of priests are taxed during times of fever, cholera, small pox, and the like; but all such epidemics combined could scarcely cause them such ceaseless work and sleepless anxiety as the Famine did, more especially in its chief centres. To those who are not Catholics, I may say that every priest feels bound, under the most solemn obligations, to administer the last sacraments to every individual committed to his care, who has come to the use of reason. What, then, must their lives have been during the Famine? Not only had they to attend the dying, but they were expected, and they felt it to be their duty, to be present at Relief Committees, to wait on officials, write letters, and do everything they thought could in any manner aid them in saving the lives of the people. Their starving flocks looked to them for temporal as well as spiritual help, and, in the Famine, they were continually in crowds about their dwellings, looking for food and consolation. The priest was often without food for himself, and had not the heart to meet his people when he had nothing to give them. An instance of this occurred in a severely visited parish of the West. The priest one day saw before his door a crowd - hundreds, he thought - of his parishioners seeking relief. He had become so prostrate and hopeless at their present sufferings and future prospects, that, taking his Breviary, he left the house by a private way, and bent his steps to a neighbouring wood. On reaching it, he knelt down and began to recite his office aloud, to implore Almighty God to have mercy on his people and himself. He did not expect to leave that wood alive. 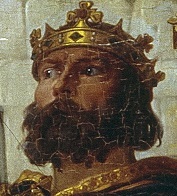 After a time he heard a voice not far off; he became alarmed, fearing his retreat had been discovered. Strange as the coincidence seems, it is perfectly true; the voice he heard was that of a neighbouring priest, a friend of his, who had taken the very same course, and for the same reason. Gaining strength and consolation from having met, and giving each other courage, they returned to their homes, resolving to face the worst. A physician, an excellent, kind-hearted man, who had been sent on duty to Bantry in the later stages of the Famine, said one day to a priest there - "Well, Father -, how are you getting on these times?" "Badly," was the reply, "for I often remain late in bed in the morning, not knowing where to look for my breakfast when I get up." 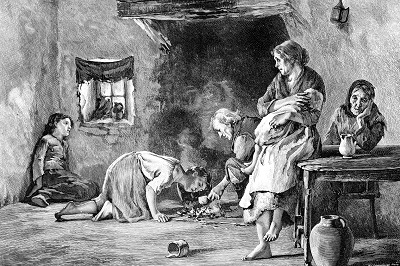 At this same time, there was a charitable lady in or near Bantry, who had discovered that another of the priests was not unfrequently dinnerless; so she insisted on being permitted to send him that important meal, ready-cooked, at a certain hour every day, begging of him to be at home, if possible, at the hour fixed. This arrangement went on for a while to her great satisfaction, but news reached her one day that Father - seldom partook of her dinner. Such dreadful cases of starvation came to his door, that he frequently gave the good lady's dinner away. She determined that he must not sink and die; and to carry out her view she hit upon an ingenious plan. She gave the servant, who took the dinner to Father -, strict orders not to leave the house until he had dined; the reason to be given to him for this was, that her mistress wished her to bring back the things in which the dinner had been carried to him. That priest, I am glad to say, is still among us, and should these lines meet his eye, he will remember the circumstance, and the honest and true authority on which it is related. A short time after the five inquests above referred to were held, the Cork Examiner published the following extract from a private letter: "Each day brings with it its own horrors. The mind recoils from the contemplation of the scenes we are compelled to witness every hour. Ten inquests in Bantry - there should have been at least two hundred inquests. Every day, every hour produces its own victims - holocausts offered at the shrine of political economy. Famine and pestilence are sweeping away hundreds, but they have now no terrors for the people. Their only regret seems to be, that they are not relieved from their sufferings by some process more speedy and less painful. Since the inquests were held here on Monday, there have been twenty-four deaths from starvation; and, if we can judge from appearances, before the termination of another week the number will be incredible. As to holding any more inquests, it is mere nonsense; the number of deaths is beyond counting. Nineteen out of every twenty deaths that have occurred in this parish, for the last two months, were caused by starvation. I have known children in the remote districts of the parish, and in the neighbourhood of the town, too, live, some of them for two, some three, and some of them for four days on water! On the sea shore, or convenient to it, the people are more fortunate, as they can get seaweed, which, when boiled and mixed with a little Indian corn, or wheaten meal, they eat, and thank Providence for providing them with even that, to allay the cravings of hunger." Although the writer of the above letter says, and with reason it would seem, that the holding of any more inquests at Bantry was useless; the very week after it was written, a batch of inquests were held there, one of which bids fair to be, for a long time, famous, on account of the verdict returned. There were forty deaths, but from some cause, perhaps for want of time, there were only fifteen inquests. A respectable jury having been sworn, the first of these was upon a man named John Sullivan. One of the witnesses in the case said a messenger came and announced to him that a man was lying on the old road in a bad state. Witness proceeded to the place, but, in the first instance, alone; finding the man still alive, he returned for help to remove him. He got a servant boy and a cart; but on going again to where Sullivan was lying, he found life was extinct. The jury having consulted, the foreman announced their verdict in these terms: "From the multitude of deaths which have taken place in the locality, and the number of inquests which have already been held, without any good resulting, he thought, with his fellow-jurors, that they ought to bring in a general verdict, inculpating Lord John Russell, as the head of the Government. That Minister had the power of keeping the people alive, and he would not do so. Notwithstanding the fatal consequences which had attended his policy, he had expressed his determination to persevere in the same course, and therefore he (the foreman) thought that he was guilty of this death and of the rest. He would bring in no other verdict but one of wilful murder against Lord John Russell." The Rev. Mr. Barry suggested that the verdict should simply record the immediate cause of death - starvation; and the jury might append their opinion as to how far it was attributable to the neglect of Lord John Russell in yielding to the interests of a class of greedy monopolists. The foreman said he wished it should be remembered that the opinion which he had expressed with reference to the conduct of the Government was that of men upon their oaths. A verdict was ultimately given of death from starvation, with the addition mentioned. The inquest was held in the Court-house, in presence of three magistrates, assisted by the Catholic clergy of the town, and the officers of the Constabulary. Other verdicts of the same tendency, although not so decided in tone as this one, were recorded in different parts of the country. At Lismore an inquest was held on a man, also named Sullivan, and the jury found that his death was caused by the neglect of the Government in not sending food into the country in due time. In this town fourteen horses died of starvation in one week. Whilst Bantry was in the condition described above, Dr. Stephens was sent by the Board of Health to examine the Workhouse there. He found it simply dreadful. Here is an extract from his report, which duty compels me, however unwillingly, to quote: "Language," he says, "would fail to give an adequate idea of the state of the fever hospital. Such an appalling, awful, and heart-sickening condition as it presented I never witnessed, or could think possible to exist in a civilized or Christian community. As I entered the house, the stench that proceeded from it was most dreadful and noisome; but, oh! what scenes presented themselves to my view as I proceeded through the wards and passages: patients lying on straw, naked, and in their excrements, a light covering over them - in two beds living beings beside the dead, in the same bed with them, and dead since the night before." There was no medicine - no drink - no fire. The wretched creatures, dying from thirst, were constantly crying "Water, water," but there was no Christian hand to give them even a cup of cold water for the love of God. Towards the end of April, the Rev. Mr. Barry estimated the deaths from famine, in Bantry alone, at four thousand. Some time ago, speaking with a gentleman, a distinguished public man, about the hinged coffin, he said: "At the time of the Famine I was a boy, residing not far from Bantry. I have seen one of those hinged coffins, which had borne more than three hundred corpses to the grave. I have seen men go along the roads with it, to collect dead bodies as they met them." Good God! picking up human forms, made to Thy image and likeness, and lately the tenements of immortal souls, as fishermen may sometimes be seen on the seashore, gathering the debris of a wreck after a storm! With such specimens of the Irish Famine before us, we cannot but feel the justice, as well as the eloquence, of the following passage: "I do not think it possible," writes Mr. A. Shafto Adair, "for an English reader, however powerful his imagination, to conceive the state of Ireland during the past winter, or its present condition. Famines and plagues will suggest themselves, with their ghastly and repulsive incidents - the dead mother - the dying infant - the feast of cannibals - Athens - Jerusalem - Marseilles. But these awful facts stand forth as dark spots in the illuminated chronicles of time; episodes, it may be, of some magnificent epoch in a nation's history - tragedies acted in remote times, or in distant regions - the actors, the inhabitants of beleaguered cities, or the citizens of a narrow territory. But here the tragedy is enacted with no narrower limits than the boundaries of a kingdom, the victims - an entire people, - within our own days, at our own thresholds."